Federal Housing Administration, or FHA, Title 1 Loans are a well-kept secret by the Department of Housing and Urban Development. FHA routinely guarantees mortgage loans made by approved lenders, such as banks and credit unions, to borrowers with less than perfect credit and moderate incomes. They are mitigating the risk of these mortgage loans for the lenders in case of borrower default. We don’t often hear about the FHA Title 1 Loan program, but it is a home improvement, renovation, and repair loan program. 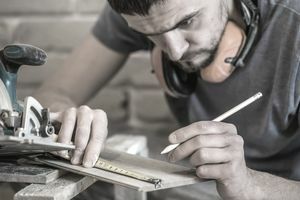 Most people automatically think of applying for a home equity loan or a home equity line of credit (HELOC) to get the money for home improvement or repair. Not everyone can qualify for either the loan or the line of credit based on the equity in their home. That’s where the FHA Title 1 Loan program steps in. An FHA Title 1 Loan is a loan available to homeowners for home repairs, improvements, and renovations that will increase the value of the home. Just like the FHA mortgage loan, FHA does not actually make the loan. They guarantee the loan, made by approved lenders, who are reimbursed in case of default by the homeowner. If you are buying a home that needs repairs, you can piggyback an FHA Title 1 Loan onto your first mortgage to fix up your new home. You can find a list of approved lenders on the Department of Housing and Urban Development website. Home repairs or improvements are expensive and not many homeowners have large amounts of money available to cover them. They need to take out a loan and seem to gravitate toward using the equity they have in their home for that type of large expense. There are cases where that isn’t possible. If you are a first-time home buyer and have very little equity in your new home, you may need an FHA Type 1 Loan, especially if you buy a fixer-upper. If you have refinanced your home in the past and have already taken the equity out of it, you may have to use an FHA Type 1 Loan if you have a need for home repairs or improvements. If you need to renovate your home for a family member with a disability and you don’t have much equity in your home, the FHA Type 1 Loan covers this use of the loan. If you desire to make your home more energy efficient, you can use an FHA Type 1 loan to make those modifications. If you want to add on a room or if you need to put on a roof or other large repair or improvement that will add to the fair market value of your home, a FHA Type 1 Loan will help cover that expense, although you may have to tap an additional source due to the loan amount limit. There are homeowners who are still underwater on their mortgages after the housing bubble. These homeowners don’t have equity in their homes and would need the help of the FHA Title 1 Loan program if they needed to make improvements or repairs. One thing you cannot do with an FHA Title 1 Loan is installing any luxury item like a sauna, steam room, or hot tub. For single-family homes, the loan limit for FHA Type 1 Loans is $25,000. For multi-family homes, the loan limit for FHA Type 1 Loans is $60,000 with a limit of $12,000 for each individual unit. Collateral is required in the form of your home unless the amount of the loan is below $7,500. This means that if the borrower defaults on the loan, the lender can foreclose on the dwelling. If the loan amount is below $7,500, then the loan is on your signature. Even manufactured homes are covered under the program and are eligible for loans of $25,090 with collateral. The term of the FHA Type 1 Loan is 20 years although there is no prepayment penalty. Interest rates on these loans depend on the lender from which the loan is obtained and are fixed. Variable interest rates are not available. The level of interest rates in the broad economy and the creditworthiness of the borrower are two other factors that help to determine interest rates. The application process for the FHA Type 1 Loan is like mortgage loans but perhaps not as rigorous. The lender will pull the credit report of the borrower and look at their credit score. Income will be checked to be sure the borrower can pay back the loan through looking at income tax returns and W-2’s, although there is no specific income requirement. The debt-to-income ratio should not be over 45 percent. You must have occupied the home for a minimum of 90 days. FHA Type 1 Loans should be a consideration when home improvements or repairs need to be made. Only around 5,500 are made each year.